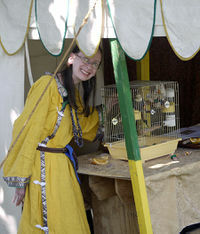 Lady Biya with feathered SCAdians Mithril and Aragorn at 2009 demo. Title Name: Fujin (Lady--first award of arms granted in SCA for aviculture, awarded under "Aisin-gioro Biya"). SCA Biography. Selected Awards: Order of the Golden Lyre (Aviculture, Mudthaw, 2010). Biya Sama (non-registered name) Fujin (Lady) has played in the Society for Creative Anachronism since 10/1990. She started her SCA career in the then Shire of Mag Mor, Calontir as (unregistered) "Anne de Lyons", an early 13th century Norman persona, and joined to pursue bardic arts which was her exclusive art throughout her Mag Mor years. Biya moved to the Shire of Shadowdale, Calontir in 1995 where she switched to her first Asian persona, Feng Yin-yue. 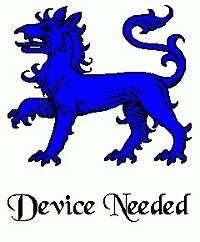 In 1996, the Shire of Mag Mor, her original SCA chapter, became a Barony. In 2000, Biya moved to the Barony of Settmour Swamp in New Jersey and shortly thereafter acquired an academic license for a digital Manchu-English dictionary. Through this dictionary, Biya (mka Laurel A Rockefeller) had the tools to choose a Jurchen-proper name and chose Biya of the Juru clan at first. She would later revise this Aisin clan for her primary persona in the 13th century and Gurun for her secondary persona with Juru being the clan designation of Biya's mentor from 1210-1215 who perishes in the Mongol seige of Yanjing. Under Jurchen (and Korean) native name customs, the clan name is only used in geneologies--being addressed by clan given name is a Chinese custom which both cultures eventually adopt--the Koreans following Mongol conquest and the Jurchens in the early Qing dynasty (17th century). Therefore, it's the given name only by which a Jurchen in period is known as. Biya is simply "Biya". Sama (female) or saman (male) are the words from which English derives the word "shaman". Manchu (Jurchens rename themselves "manchu" in 1636) is the dominant Altaic tungusic language. Biya is best known as the guild mistress and founder of the Known World Aviculturists Guild, the guild that studies companion birds in period. In addition to birds, Biya is a student and promoter of Asian history and cultures in the SCA, a bard, a jeweler, herbalist, and even spins and makes her own costumes, though these fiber arts are not things she feels she does especially well compared to the other skills she possesses. She is steward to two small cockatoos, cockatiels Mithril and Aragorn. Biya Sama was born in December, 1205 CE by the western calender, in a small village in Liaodong (Liaoning) province just outside of Mukden (Shengyang). Her family had lived in the same village since the Bohai days when their Mohe ancestors and the followers of a great general followed him westward out of Korea to become one JURCHEN people in 698 CE as the Bohai state. Being very bright both intellectually and spiritually, Biya, however, was not content to simply do her chores and mind her manners like a good girl. As she tried to learn simple household tasks like spinning and sewing, her mind would quickly wander and she would fall into trances with enormous speed by the age of 4. Once, while so entranced, she took apart her older brother's hunting bow--a formidable task for even a grown adult for her brother was quite strong. When her brother discovered what seemed like a prank, he beat her vigorously and viciously until she bled. Then, in 1210 by the western calender, a great sama (shamaness) heard of this feat and of her brother's vicious reprisal. The sama of the Juru clan rode hard and fast to the little village to see this child for herself. When she came upon the small house, she quickly used her mastery of herbalism to sooth the girl's wounds and said prayers over her to help with her healing. She laid hands upon the wounds to ease her pain then told her in a quiet voice that there were ways to learn to notice the pain far less--if she had mind to learn the ways of her people. Eager to learn, Biya asked to know all that could be learned. Then the shamaness tested the girl. When she was done, she packed the girl's belongings and took her away. She took the girl to the city where, she told her, she was on her way to go in the first place--Yanjing, the capital city where the Jin emperor ruled by Chinese custom. For five years, Biya studied with her mentor--until 1215. Then came Temujin the Khan with his mighty hordes. Her mentor got her out of the city, but Biya's teacher perished in defense of Yanjing. Biya would never forget that loss--or the sight of the city she loved burning before her. She fled north, into first Liaodong, then Jilin. News of her status as a refugee made it easy to find another mentor. She stayed away from the war, and Mongols, for as long as she remained an apprentice, taking refuge in the solitude and peace of the many mountains of Manchuria where the stories told her the dragon teachers still live, the guardians of all Jurchens. In 1223, she passed her trials and became SAMA herself. Now the burden for healing the hurts inflicted by the Mongols was hers, as was for keeping the history of her people--more and more important as the written records of her people were destroyed by war. And inspiring the resistance also became her responsibility, even though doing so most certainly risked death at Mongol hands. Her people could not forget how much they value freedom, freedom to be their own culture, keep their own goddesses and gods--unhindered by foreign powers. She was forbidden to shed blood, yet she would fight. Her culture was at risk. She would not let her people die. "Foods for Parrots: Seeds and Grains in Medieval Aviculture", Winner of Queen's Favor, Mudthaw, 2009. 03/01/2008. This page was last edited on 4 January 2018, at 10:46.